This is a sponsored post brought to you by Spiral Spring. Thank you for supporting the brands who make this website possible! Spirulina is an important ingredient to add to a clean, healthy diet and a must-have for vegans. It’s an amazing powerhouse of nutrients! It surpasses the protein, calcium and iron in animal products, like meat and dairy, many times over. In addition to being an excellent source of 70% high quality vegan protein, it also contains amino acids, vitamins, minerals, antioxidants, as well as, omega-3 and omega-6. But the quality of your spirulina is just as important as the health benefits you get from it. Spiral Spring brings you a unique variety of the most potent spirulina that you can’t find anywhere else. What Makes Spiral Spring different? Did you know there are two different Spirulina species? Spiral Spring is the only one in the world who produce “Spirulina Maxima” and this is certified by PhycoTech Institute in the USA. Most of the Spirulina in the world is “Spirulina Platensis“, which is not as complete as “Spirulina Maxima” in terms of content of protein, chlorophyll and phycocyanin, therefore the better for nutritional and therapeutic purposes. Many distributors say they have “Spirulina Maxima“, but they cannot prove it. Not only are you getting the highest quality of spirulina from Spiral Spring, but the cleanest. Another thing I love about Spiral Spring is their production process. “Our products are grown and harvested in one of the purest ecosystems in our planet, the pampa aquifer in the Atacama Desert in northern Chile. The water used in growing our spirulina comes from the melting of the Andes mountains and along with the purity of the world’s driest desert this combination produces an unparalleled standard of excellence. This makes me feel good to know that I’m getting the highest quality and cleanest spirulina on the market. 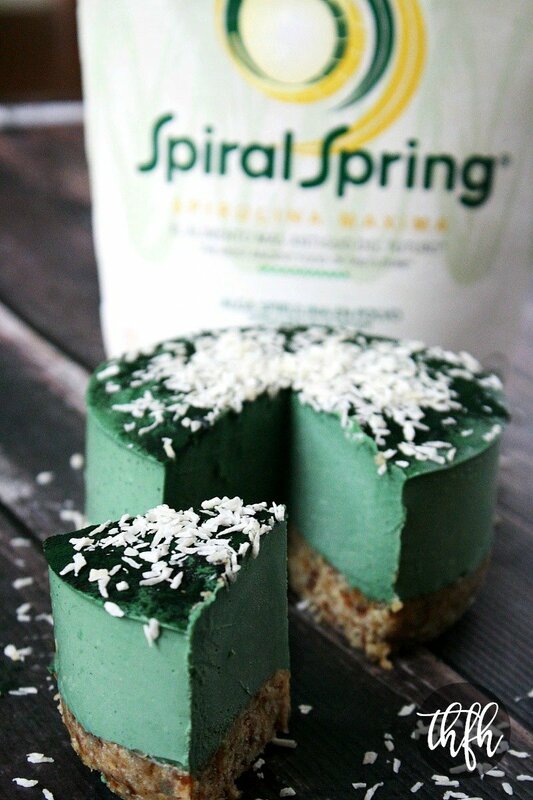 Now about the recipe I made with Spiral Spring Spirulina Maxima! 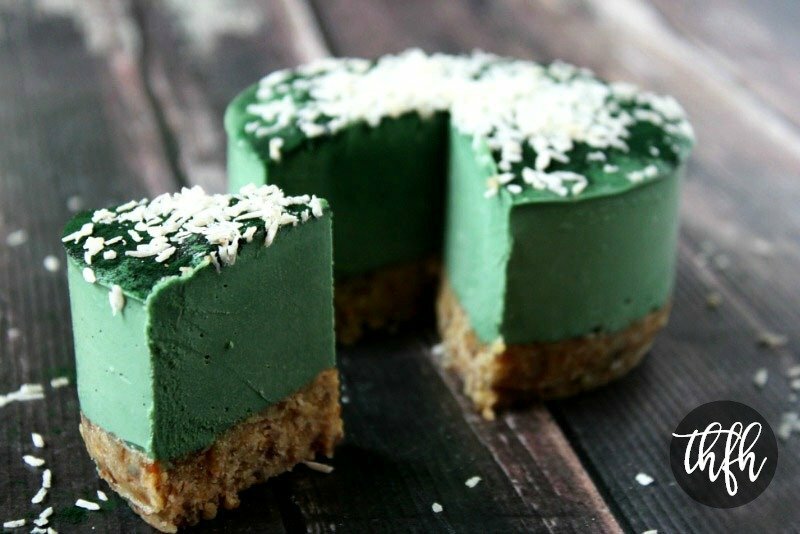 While I normally just add spirulina to my smoothies, I decided to show you a different way to incorporate spirulina into your diet by making a Raw Vegan Spirulina Cheesecake. 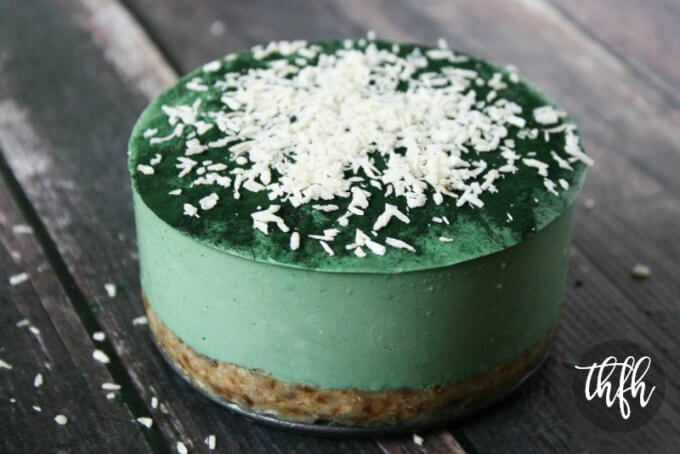 Yes, it’s true…a spirulina cheesecake! You have a clean, whole food dessert made with only 8 nutrient-dense ingredients and all the benefits of spirulina. And, this has to be one of the prettiest colored cheesecakes I think I’ve ever made…the color is amazing! This dessert is organic, raw, vegan, gluten-free, dairy-free, soy-free, egg-free, no-bake, paleo-friendly and contains no refined sugar. Transfer the mixture to a 6-inch spring form cheesecake pan and press firmly in the bottom of the pan. Set aside. Optional: Soak the cashew in filtered/purified water for 15-30 minutes. This will make them soft and the mixture extra creamy. Optional: Sprinkle the top with organic shredded coconut, extra spirulina, organic hemp seeds, organic chia seeds, organic cacao nibs, etc. Store in an air-tight BPA-free container in the refrigerator or freezer until ready to serve because it will become soft and lose it's shape if left out at room temperature. The recipe and photographs for "Raw Vegan No-Bake Spirulina Cheesecake with Spiral Spring Spirulina Maxima" by Karielyn Tillman of The Healthy Family and Home website are licensed under a Creative Commons Attribution Non-Commercial No Derivatives 4.0 International License and cannot be used without my written permission. General Disclosure: This post is sponsored by Spiral Spring. I received product to review and use in creating a new recipe. I was under no obligation to give a positive review and was compensated for my time. All thoughts, opinions and comments are my own. Thank you for supporting the brands who make this website possible! Thanks for Sharing, Organic Spirulina is 100% vegan and is loaded with the multivitamin and nutrients. Spirulina protects us from dangerous diseases like cancer, heart disease, boost natural energy. 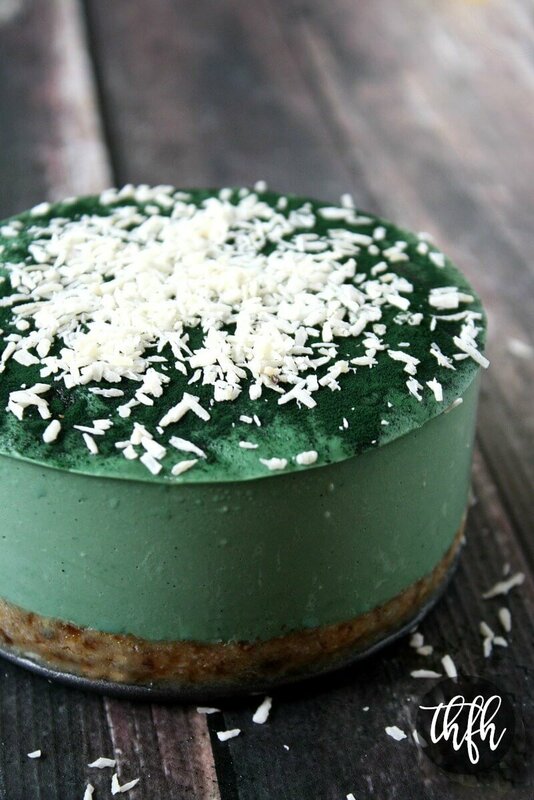 I love cheesecake and spirulina, so I am definitely going to try this recipe. Spirulina has so many great benefits, I also have a recipe on how to use it has a face mask and a detoxing agent. Yes, in this recipe there will be no dairy or cream cheese. Instead, cashews are used to make the creamy “cheesecake”. It will come out extra creamy and smooth if you soak and drain the cashews first (the longer the better) and use a Vitamix. The cashews and coconut oil will make a nice firm “cheesecake” filling that’s a great replacement for traditional dairy cheesecakes. I have other cheesecake recipes with other flavors too if you want to see if there is another version that you might like even more. Just type “cheesecake” in the search bar on my website.